Originated in Europe in the 18th century, Rummy is a card game that involves making of three of four card combinations of same rank or same suit. As the game involves no betting factor and individual play, it has been classified as a skill game under law. Popularly known as club game, Rummy is played in different variants in different countries. Some of its popular variants are Gin Rummy, 13-card Rummy, etc. Originated in the 20th century, poker is a skill game that involves making of the best 5-card combination from 2 cards dealt privately to each player and three community cards dealt on the table. Poker is the most popular card game with global presence and mass appeal. Though poker is played in various forms and types, it’s most commonly played variant is Texas Hold’em. The primary difference between Rummy and Poker is the game play. Moreover, in rummy players are dealt minimum of 13 cards while in poker players are dealt minimum of 2 cards. However, the game play in both the games not just depends on the cards a player is holding, it depends on the skills he/she possess for playing the game. Though both the rummy and poker fall under gambling category, but these games stand equal to skill game – chess which is listed under Sports category. 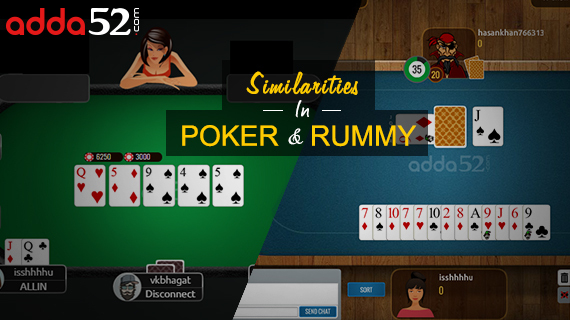 You must have read a lot about the difference between poker and rummy but did you know both the games share few similarities as well. Both poker and rummy involve high degree of skill and less degree of luck. For instance, rummy requires more of mathematical calculation and poker involves more of critical reasoning. Dealer plays an important role in both the games. It is the dealer who has to deal the cards to kick-start the game. Further, in live games dealer record keeps the pot calculation, and check if the player’s are following the game rules. Both the games require a minimum of two players to start the game. Both the games require cards need to be organized and arranged in sets and sequences. Players have a choice to fold anytime during the game. Players have to asses and evaluate the cards they have been dealt and bet accordingly. Further, they need to show their cards once the winner is declared. To summarize, both rummy and poker are great games to play. So, whatever you choose to play – poker or rummy – just remember these card games will not only help in money making but also help in enhancing your skill set.